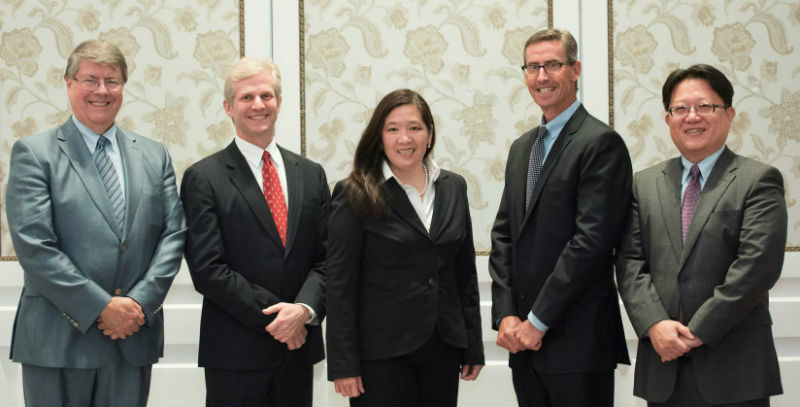 TAIPEI, TAIWAN, October 31, 2016—Duane Morris LLP announced today that it has opened an office in Taipei, Taiwan (Republic of China)—Duane Morris & Selvam Taiwan, a foreign legal affairs law firm—after securing approval from the Ministry of Justice. Through its new presence in Taiwan, attorneys across the Duane Morris global platform will work closely with clients to achieve their business goals, with emphasis on intellectual property for Taiwan's robust high-technology, pharmaceutical and bio-tech industries, as well as in commercial and corporate transactions, antitrust and regulatory compliance, white collar litigation and investigations, and foreign trade and investment. "Our new Taiwan office is a logical next step in the long-term strategy for our international operations and our continued growth in Asia," said Duane Morris Chairman and CEO John J. Soroko. "We already have extensive experience working with Taiwan-based multinational companies, and our global platform will help facilitate the business of Taiwanese companies operating cross-border, with focus on the U.S."
Taiwan's powerful economic engine, Soroko noted, encompasses industries as diverse as pharmaceuticals and life-sciences, semiconductors and high-tech manufacturing, alternative energy, shipping and other transportation concerns, consumer goods, and construction. "With our experience in all these areas in the U.S. and around the world, we expect to be of great service to many of these Taiwanese business sectors," he said. Duane Morris has long represented Taiwanese companies, particularly in intellectual property, corporate and litigation matters. For instance, the firm represents Taiwan Semiconductor Manufacturing Company (TSMC), the world’s largest semiconductor foundry company, in various intellectual property matters in the U.S., including patent infringement litigation, inter partes reviews and patent prosecution. Other Taiwan clients have included Acer, Epistar, AU Optronics, VIA Technologies, Innolux, Nanya Plastics and Giant Manufacturing. In March 2015, Richard L. Thurston, Ph.D. rejoined Duane Morris in the Intellectual Property Group in the firm’s New York office. He had previously served as senior vice president and general counsel of TSMC in Taiwan, after beginning his legal career at Duane Morris. Fluent in Mandarin, Thurston has served as an advisor to the Taiwanese, South Korean, Japanese and Vietnamese governments on intellectual property protection and reform. Most recently, he was instrumental in obtaining the passage of key legislation in Taiwan which established new rules and court procedures to enhance the protection of trade secrets. Thurston holds M.A. and Ph.D. degrees from the University of Virginia in addition to his J.D. from Rutgers University. He has taught intellectual property law in both Taiwan and the U.S.
Richard Thurston, Christopher Neumeyer, Vicki G. Norton, Ph.D., L. Norwood “Woody" Jameson and Eric Chu at the Duane Morris & Selvam Taiwan inaugural celebration. In Taiwan, Christopher M. Neumeyer has joined the firm as special counsel in the Intellectual Property. He is joined by legal consultant Cheng Hsiang "Eric" Chu. Neumeyer has practiced in Taiwan since 2000, including as counsel at Texas Instruments and legal director at Lite-On Technology Corp. He assists companies in the development, manufacture and sale of technology products and services, including with respect to patents, trade secrets, licensing and litigation and has led over $1 billion in corporate transactions. Technologies he has worked with include LEDs, semiconductors, computers, monitors, power supplies, Internet access devices, cell phones and camera modules. Neumeyer earned a J.D. in 1990 from the University of Oregon School of Law, and holds M.A. and B.A. degrees from Humboldt State University. He is licensed to practice law in California. Chu has advised companies in a variety of industries in Asia and globally with regard to patent licensing, patent infringement actions and IP clearance matters. He was in-house counsel for TSMC and Winbond Electronics Corporation. At TSMC, Chu supported various litigation matters and IP-related transaction matters. At Winbond, he was responsible for supervising all U.S. patent litigation and U.S. antitrust litigation matters. Chu was also responsible for drafting, communicating and negotiating several in-bound and out-bound licensing projects. He earned an LL.M. in Intellectual Property Law from George Washington University Law School. He also holds an LL.M. from Soochow University in Taipei, Taiwan and a B.A. from Tunghai University in Taiwan. Chu was active as a member of the Giles S. Rich American Inn of Court in Washington D.C., which focuses on intellectual property law practice. He is a native Mandarin speaker. Taiwan's economy is based on exports, led by electronics, machinery and petrochemicals. One of the so-called "Four Asian Tigers," the four highly developed free-market economies in East Asia, Taiwan is one of the largest economies in Asia, and a force in the technology industry. International technology companies such as computer manufacturers Acer Inc. and Asus, mobile phone maker HTC and electronic manufacturer Foxconn are headquartered in Taiwan. Duane Morris LLP provides innovative solutions to today's multifaceted legal and business challenges through the collegial and collaborative culture of its more than 750 attorneys in offices across the United States and internationally. The firm represents a broad array of clients, spanning all major practices and industries. Duane Morris & Selvam Taiwan attorneys work closely with clients to achieve their business goals, with emphasis on intellectual property for the country’s robust high-technology, pharmaceutical and bio-tech industries, as well as legal issues involving commercial and corporate transactions, antitrust and regulatory compliance, white-collar litigation and investigations, and foreign trade and investment. Duane Morris & Selvam LLP is the joint law venture consisting of international law firm Duane Morris LLP and Singapore-based Selvam LLC, with headquarters in Singapore. It serves clients throughout Asia, as well as companies based in the Americas and Europe that are conducting business in Asia and Asian entities and individuals doing business in the Americas and the United Kingdom.